Who is this mysterious “Murder Halloween Bird Man?” I’ve never heard of such an individual… how would I even begin to communicate his nature to someone else, especially if I were to be a police sketch artist? I suppose I might draw a neurotic chap with a large nose, holding up a knife… and then my 60 seconds would be up. Oh well. It’s someone else’s problem now. I’m sure you’re wondering about the provenance of the unlikely epithet above. To be perfectly honest, I’m not fully certain from where it originated – except within the strange confines of another player’s mind. It’s the natural and constant consequence of the gameplay in Telestrations, which takes the classic game of Telephone and transforms it into alternating rounds of writing out a word and then forcing the next player in line to sketch what you wrote. 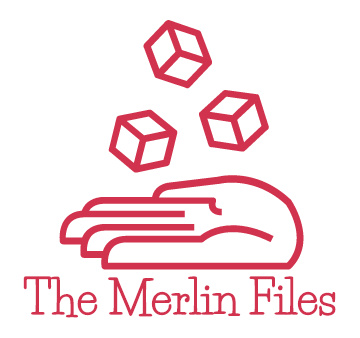 This is a game for groups, accommodating up to eight players, and ideally suited for laughter and nonsense. It doesn’t take long for things to go off the rails far harder than Telephone could ever manage. 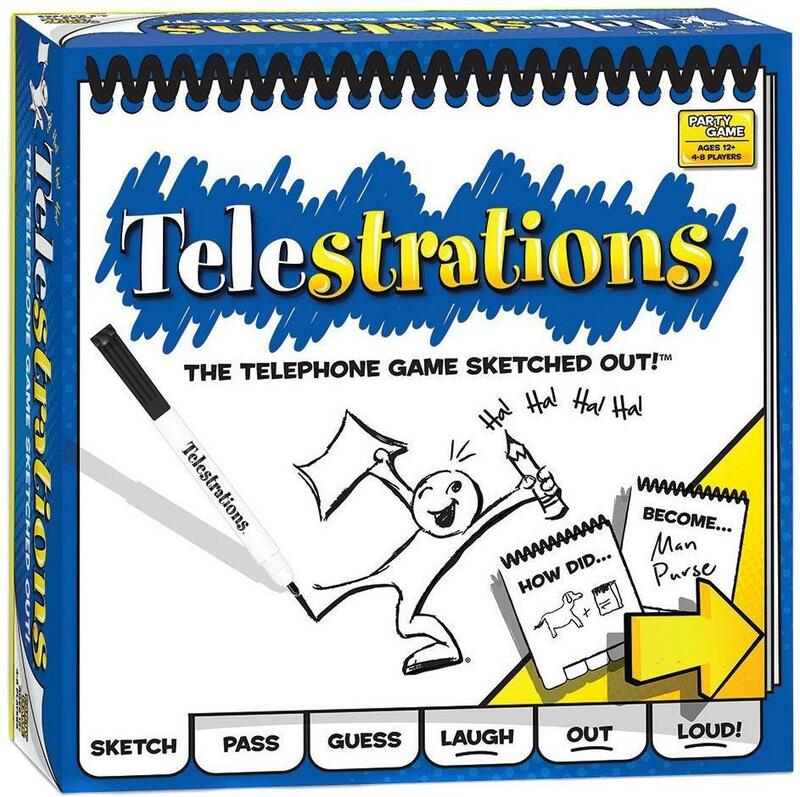 Sure, in the original game you could get “Banana condos are groovy” from “Anaconda: the Movie,” but only in Telestrations can a perfectly normal and everyday word get mutilated into the utterly bizarre outcomes Telestrations considers routine. The magic fueling the madness is the old adage, “a picture is worth a thousand words.” Nowhere in that sentence is any stipulation that the thousand words make any amount of sense, and it turns out that 60 seconds with a dry-erase marker does not a master artist create. The simultaneous progression means there’s no downtime for anyone, and there really shouldn’t be – games of this nature are intended to be silly and social. Glaring at the player adjacent to you becomes the norm when they hand you either a nonsensical drawing or an equally nonsensical interpretation of a picture they’ve just seen, which you now have to depict. At the end of the round, each booklet is reviewed to see just how severely mangled the original words have gotten – from time to time, something will survive, but more often than not a basic idiom will spiral out of control, It’s important to point out that Telestrations considers itself (officially) to be a game that involves scoring and some degree of competitive effort geared toward attempting to maintain order amid the chaos – that is to say, minimizing silliness drift and making logical or at least narrow guesses rather than outsize flailing. So anyway, don’t do that. Functionally, this is a toy, a toy for groups to sit around and let their poor artistic skills and even weaker abilities to interpret 60-second sketch art run perfectly logical start points into the dirt at breakneck speed. An “After Dark” edition exists that trades in more salacious starting terms, but I’ve seen Telestrations go out-of-bounds rapidly when the wrong mind is combined with the wrong term. I shall continue to loudly protest that a beaver is a small aquatic mammal with a flat tail. I shall no doubt continue to be overruled by tides of laughter. I can’t imagine Telestrations would have much staying power if played with any sense of competition or a need to stay “within the lines,” but fortunately it’s extremely easy to ignore the “rules” of the “game” and just do your own immensely sily thing with it. The result is a charming social time-waster that may offer some opportunities to question your friends’ sanity.